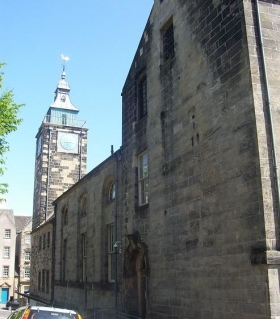 Once reviled as the 'worst jail in Britain', and formerly Stirling’s Council Chambers, Courtroom and Workhouse, the Tolbooth has since established itself as one of Scotland’s most popular venues for live music and the arts. A 'townhouse' - where locals could pay tolls and taxes, and where the courts and council met - stood on this site from the earliest days of the Royal Burgh, in the 12th-century. With this Medieval structure threatening to collapse, a new tower was built by Sir William Bruce of Kinross (who famously re-modelled Edinburgh's Palace of Holyrood), in 1706. Gideon Gray added the Broad Street council chambers later that century, and Richard Crighton provided the St John Street cell-block and Judge's Robing Rooms (now the bar) in the early years of the 19th-century. The Tolbooth has continually played an important role in Stirling’s cultural life since its inception. In 2002, it reopened after an extensive and ambitious restoration programme, which was spearheaded by award-winning architect Richard Murphy. Listed as a category A building, interference to the original foundations of the building were kept to a minimum, leaving the redesigned music hall with a distinct 18th-century character. Since reopening the Tolbooth has swiftly developed a reputation for being one of Scotland’s best live music venues. It also acts as home for Stirling Council’s Culture Team, while some of Scotland’s best musicians and performers have appeared at the grand venue over the years.